Kanagavalli is such an energetic and happy person that one can never imagine the tears she holds back when she speaks about her life as it was prior to HoPE. All seemed well enough for a while. Kanagavalli was married and had an adorable baby girl named Abinaya. Her husband earned just enough to meet the family’s monthly expenses. Her father-in-law also lived with them. Kanagavalli stayed home to take care of him and soon became pregnant with a second child. When their son Akash was born, the family received distressing news. The baby had been born with a serious disorder. He could not move because his spine could not support his body. Worse yet, it was unlikely that he would ever speak or be able understand what was happening around him. His mother’s greatest concern was that the family would never be able to afford expensive medical care that her son would need throughout his life. Determined to find a way to care for him, she began a job teaching at HoPE Learning Centers. Now Akash is two years old, and Kanagavalli brings him to work so that he can see other children in her class. Even though he can’t participate, the daily interaction with the other kids seems to make him happy. 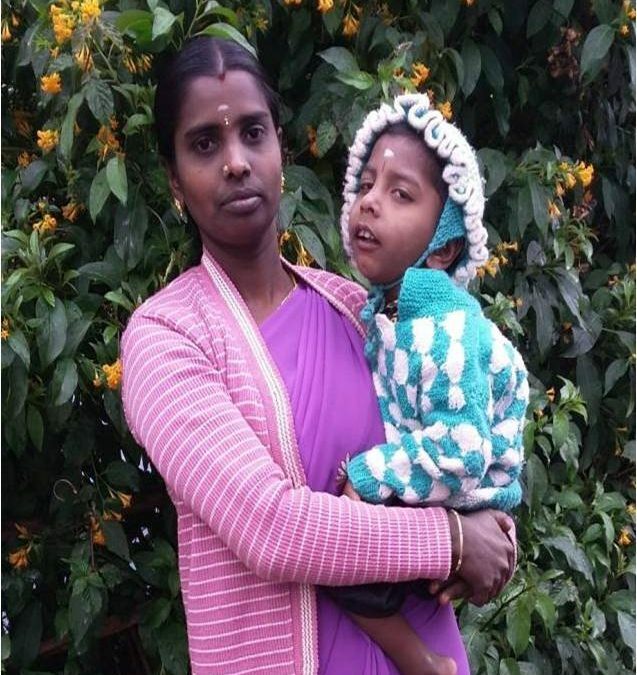 Kanagavalli is grateful to Tripura Foundation for the opportunity to teach the children and for the salary she earns by working there, which is most vital for her son’s treatment. She teaches her students with dedication, and she has helped many other children embrace and overcome their challenges. HoPE Learning Centers not only provide desperately needed services and support to the communities they serve, they also provide employment opportunities to help good people like Kanagavalli grow and thrive in spite of the difficulties of life in these impoverished communities. Please consider pledging a regular donation to HoPE Learning Centers today.